For private tour 4 - 8 people please click on Independent Tour above to view the rates. Overnight flight for Poland. Meals served during the overnight flight. Upon your arrival, after passport control and claiming your luggage, meet with your IBMT Tours European Tour Manager, who will accompany you on this journey. Private minivan transfer from the airport to your hotel in Krakow for check-in. Queen Boutique Hotel 4* (TBC) or similar. Time to refresh. 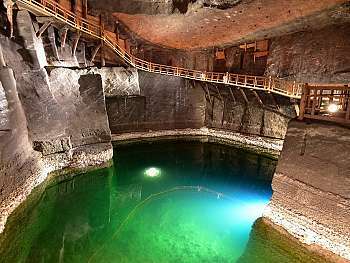 -The average time needed to complete the route together with visiting the Krakow Saltworks Museum is approximately 3 hours. -Please bring warm clothing. Temperatures underground range between 14° and 16° C.
-This visit is always conducted under the supervision of a guide. After your visit return to your hotel. Dinner and rest of the day on your own. Overnight in Krakow. Buffet breakfast will be served in your hotel. Meet your local guide for a an informative guided tour of the historic center of the city. Your tour this morning includes the Kazimierz Quarter, Market Square, Altshul (Old Synagogue), Rema Synagogue and the Cemetery, the Temple – Reform Congregation and the Galicia Jewish Museum. 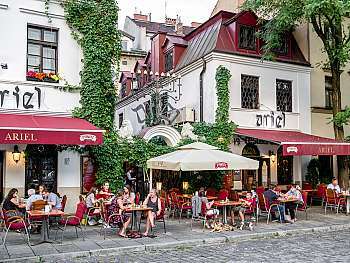 Before world war II, “Kazimierz was a Jewish district where Jewish culture flourished. The neighboring district of Podgórze, became the scene of Nazi devastation, with most of the remaining Jewish population fleeing after the war. Now, you can experience the history of this interesting district and see exactly why Steven Spielberg chose it as the set for his film, Schindler's List. Entrances included in this visit: Old Synagogue (Altshul), Rema Synagogue and Cemetery, Temple and the Galicia Jewish Museum. During the afternoon continue your guided tour of Podgórze (Jewish Ghetto). Rest of the day on your own. Overnight in Krakow. Hotel check-out and departure for Auschwitz. A somber 3.5 hour guided tour of the Concentration Camp of Auschwitz I and II (Birkenau). 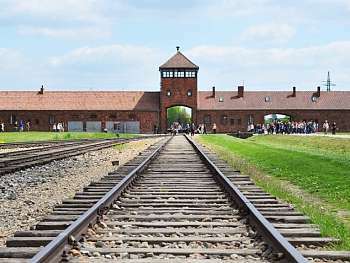 “Tour the permanent exhibitions and buildings at the Auschwitz I-Main Camp and the most important original camp buildings in Auschwitz II-Birkenau: The prisoner barracks, the unloading platform (ramp), and the ruins of gas chamber and crematoria II or III. 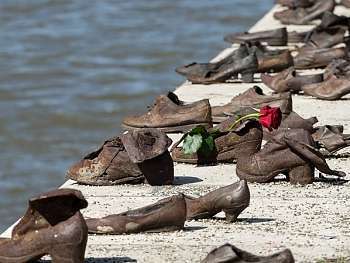 There is no way to understand postwar Europe and the world without an in-depth confrontation between our idea of mankind and the remains of Auschwitz. Boxed lunch will be provided after your guided tour. known for its Gothic and Baroque buildings and its astronomical clock, known as "Orloj". Check in to hotel K+K Hotel Fenix 4* (TBC) or similar. Rest of the day and dinner on your own. Overnight in Prague. After the Bar Mitzvah Ceremony and lunch get ready for head up to ?eský Krumlov. 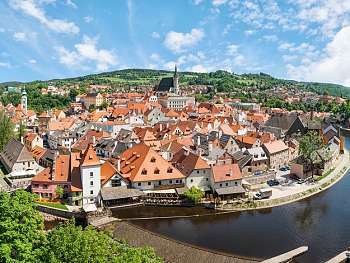 Meet with your guide and leaving Prague, we head to Ceský Krumlov one of the picturesque towns in Europe. On arrival stroll through the winding streets, the romantic hermitages and a unique urban complex dominated by the imposing castle construction on a bend of the Vltava River. The city has plenty of excellent exhibitions of the most famous artists from around the world, concerts, music festivals, theatrical performances, taverns and even medieval taverns. Since 1992 the historical center and the complex of the castle buildings have become part of the UNESCO world heritage. Visit (entrance included) the Ceský Krumlov Castle and listen to explanations of a local guide. The Castle is the second largest monumental complex of the Bohemian region, belongs to the most precious dwellings of Central Europe. Its building development has been preserved with the original layout, material structure, interior installations and architectural details from the 14th to the 19th century. After your visit in Ceský Krumlov we will check into our hotel K+K Hotel Fenix 4* (TBC) or similar. Included admissions: Maisel, Pinkas, Klausen, Spanish and Old-New synagogues. Old Jewish Cemetery and the Ceremonial Hall. End of your guided tour. Lunch on your own and return to the hotel to refresh, relax and get ready for tonight’s river dinner cruise. Arrival at the pier for embarkation for a cruise on the Vltava River. At the end of the cruise return to your hotel and overnight in Prague. Depart for Terezin where you will meet with a local guide for your visit of the town. Learn about some of the darkest days in European history on a full-day tour to the Terezín Concentration Camp in the sleepy Bohemian countryside. Terezín played a double role, both in the Nazi pursuit of the Final Solution, and their propaganda efforts to conceal the Holocaust. See the monuments and memorials at Terezín and visit the museum to find hidden traces of its dark past. Included entrance tickets: Small Fortress, Ghetto Museum and Magdeburg Barracks. After your visit in Terezin time for lunch on your own. Return to Prague. Rest of the day at leisure. Dinner in a local Prague restaurant (with Folk Music) Overnight in Prague. Hotel check-out and depart for Budapest, the capital of Hungary enjoying the panoramic view en route to Budapest. Stop for lunch on your own (place for lunch will depend on the route taken by the driver, could be Bratislava or Vienna). Arrival in Budapest and check into your hotel Danubius Hotel Astoria City Center 4* (TBC) or similar. Dinner in a local restaurant. Overnight in Budapest. Meet your local guide for this morning guided tour of the Jewish Ghetto of Budapest. Discover the area of the former Ghetto and its synagogues,cemetery, memorials and unique architecture. The three major religious wings of Hungarian Jewry are represented by the Jewish Triangle. Explore the history, culture and religious life of a community that plays an important role in the development of multicultural Hungary. Included admissions: Dohany Street Synagogue and Jewish Museum. After your guided tour time for lunch on your own. Celebrate Shabbat dinner in a local restaurant. Meet with your local guide for your classic Budapest sightseeing tour. Learn about Hungary’s 1,000-year-old history and such landmarks as St. Stephen’s Basilica, the Parliament, and more. Walk around the Buda Castle District, soaking up city views from Fisherman’s Bastion and Gellért Hill, and view the monuments to Hungary’s kings and national heroes at Heroes’ Square, Liberty Square and the Shoes on the Danube Promenade. End of your guided tour and time for your own lunch. After your lunch take our private minivan for a visit of Szentendre Center and the Synagogue accompanied by your Tour Manager (25 minutes’ drive from Budapest). The enchanting little settlement (Szentendre) next to the Danube bank is nicknamed the artists’ town for a reason. You will be sure to fall in love with Szentendre’s galleries, museums and local manufactures inside the centuries old buildings while walking along the town’s trademark cobblestoned streets. Return to Budapest for the balance of the day at leisure. Dinner in a local restaurant. Overnight in Budapest. Buffet breakfast will be served in your hotel. You will be transferred to the airport for your flight back home. (In case of an early flight a boxed breakfast will be provided by the hotel). *Room category is based on standard run of the house unless otherwise noted. Prague: 3 days of touring in a luxury, air-conditioned vehicle with licensed, English speaking local tour guide. Budapest: 3 days of touring in a luxury, air-conditioned vehicle with licensed, English speaking local tour guide.